Drug delivery includes formulations, technologies, methods, and systems for transferring an active pharmaceutical ingredients into the body to safely provide therapeutic effect. 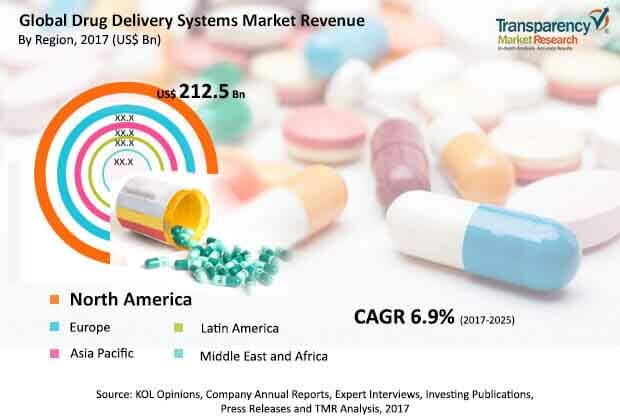 The global drug delivery systems market was valued approximately US$ 510 Bn in 2016 and is anticipated to expand at a CAGR of over 6.9% from 2017 to 2025 to reach approximately US$ 900 Bn by 2025. Increase in demand for self-administration and home health care devices are likely to fuel expansion of the global drug delivery systems market from 2017 to 2025. Continuous innovations in the global drug delivery systems market is creating opportunities for major and local manufacturers to develop wide product portfolio. Additionally, collaborations among major market players for superior technological advancements in drug delivery offerings is likely to drive the global drug delivery systems market during the forecast period. Using nanotechnology, the drug can be targeted to a precise location, which makes drugs more effective and reduce the chances of possible side effects. Major manufacturers operating in the market are involved in continuous research & development activities to expand their already wide product portfolio. For instance, on September 2017, Baxter International Inc. announced the launch of DeviceVue, an asset tracking system for sigma spectrum infusion system whereas, emerging players operating in the market are also focusing on introducing new versions of their existing drug delivery devices. Continuous expansion of drug delivery systems offering in high throughput along with reduced waiting time and improved result specificity are likely to drive the global drug delivery systems during the forecast period. However, high cost associated with treatment and increase in drug recalls are likely to restrain the global drug delivery systems market during the forecast period. The global drug delivery systems market has been segmented based on delivery system, application, route of administration, and geography. In terms of delivery system, the targeted drug delivery segment is projected to continue its dominance during the forecast period followed by the polymeric drug delivery segment. Introduction of new drug delivery devices such as SmartDose wearable injector and increase in demand for targeted and low dose frequency drug delivery is likely to propel the segment. Based on application, oncology was the leading revenue generating segment in 2016 and it is likely to continue its dominance during the forecast period due to the increase in prevalence of various types of cancer. According to WHO report, in the year 2015, around 70% of cancer-related deaths occurred in low- and middle- income countries. The infectious diseases segment is likely to lose market share during the forecast period owing rise in preference to develop oncology and diabetes drug delivery system by manufactures. In terms of route of administration, injectable dominated the market in 2016 and is likely to account for a leading share during the forecast period. Geographically, North America accounted for a leading share of the global drug delivery system market in 2016. However, rise in research & development expenses for advanced drug delivery devices in the U.S. is key concern area among key players. The market in Asia Pacific is projected to gain share during the forecast period and is likely to be key revenue generator in the next few years. Initiatives by local governments for self-sufficiency in manufacturing pharmaceuticals and prevalence of various diseases in countries such as Brazil, South Africa, Saudi Arabia, etc. are anticipated to boost market in Latin America and Middle East & Africa. Key companies operating in the global drug delivery systems market and profiled in the report include AstraZeneca plc., Bayer AG, Pfizer, Inc., Novartis AG, Amgen Inc., Johnson and Johnson Services, Inc., Baxter International, Inc., Boston Scientific Corporation, and Becton, Dickinson & Company. These players adopt organic and in-organic growth strategies to expand their product offerings, strengthen their geographical reach, increase customer base, and garner market share. For instance, in June 30, 2017, the F. Hoffmann-La Roche Ltd. acquired mySugr, a company that is dedicated to developing applications and software for diabetes care. Based on delivery systems type the global drug delivery systems market is segmented into intrauterine implants, prodrug implants, polymeric drug delivery, and targeted drug delivery. The type of delivery system segment have been analyzed based on type of devices used to deliver drugs for different applications in various regions. The market size and forecast for each of these segments have been provided for the period from 2015 to 2025, along with their respective CAGRs for the forecast period from 2017 to 2025, considering 2016 as the base year. According to application the global drug delivery systems market is segmented into infectious diseases, oncology, urology, diabetes, CNS, and others. The market size and forecast for each of these segments have been provided for the period from 2015 to 2025, along with their respective CAGRs for the forecast period from 2017 to 2025, considering 2016 as the base year.